How do you have the ultimate brunch? I remember wondering that aloud when I received an extremely vague email asking me to meet on Sunset Boulevard where I would be ushered with some fellow influencers and bloggers for "the ultimate brunch" experience with Chambord. The email kind of sounded like a great time ready to go down or a kidnapping ready to happen. Thank goodness it was the former and not the latter. I knew of Chambord as a tasty raspberry flavored liquor that came in a cute bottle so... I figured why not? At least if I ended up kidnapped I would have be well-fed with shots of Chambord, right? I stepped onto a private mini bus with fellow influencers and was greeted with this! Man servants!!! Yes, you read that right. Man Servants is actually a company that "is there to treat you like a queen." *hair flip and snaps* That's their company tag line. Our man servants were total sweethearts and great company. 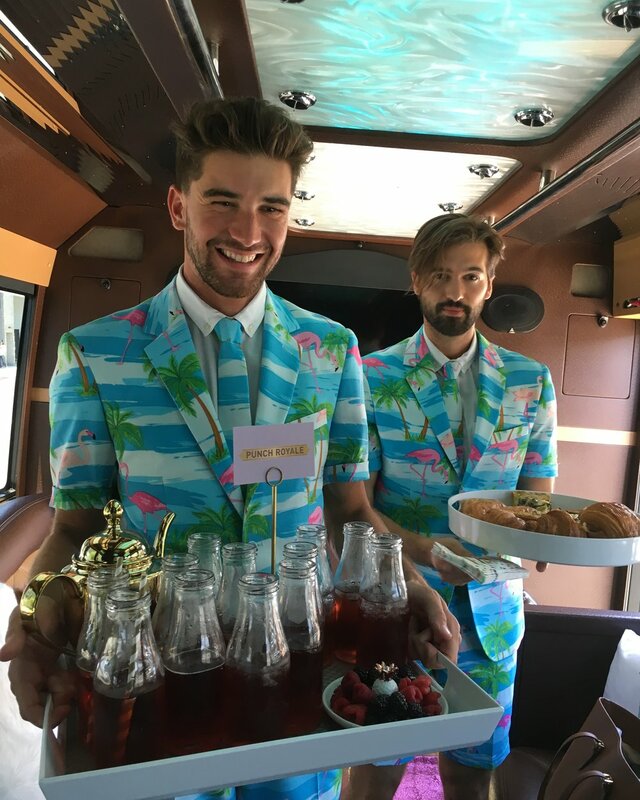 They provided us with entertainment, refilled our Chambord cocktails, and handed us pastries from Republique as we drove to a secret location in order to experience the ultimate brunch! This was a dream come true. Attention future bachelorettes or bachelors: Book these guys! 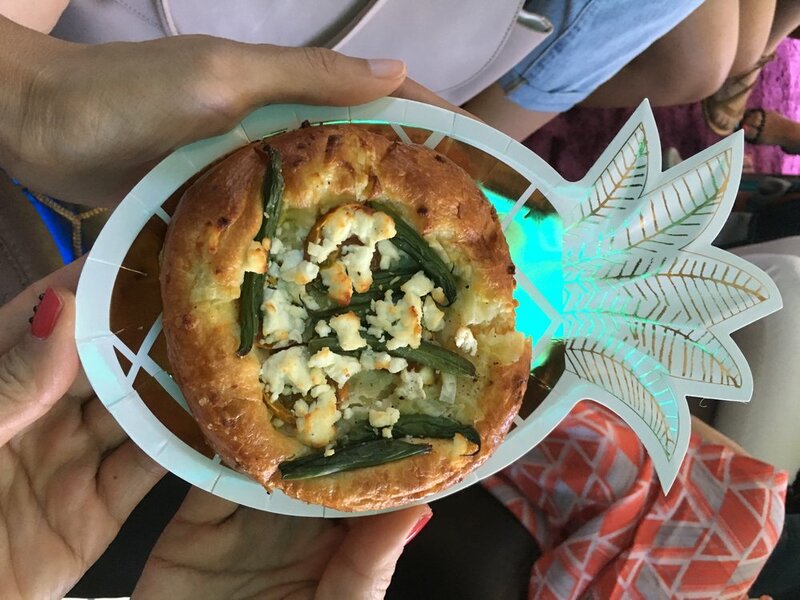 On a separate note... how cute were the pineapple plates? Once the car stopped, our lovely man servants welcomed us off the bus. They even fanned us in the hot weather. So sweet! So where was Stop 1? Los Angeles, CA 90049 Fleurish is a design-it-yourself flower company. We were treated to a day of flower arrangement and design using the freshest flowers in season while (you guessed it) sipping Chambord cocktails with our man servants. A gal can really get used to this! We had a lot of guidance. Jose was a big help. I'm not a very artsy crafty person, but even I was able to make something nice. As we were trying to complete our flower arrangements, our man servants showed up with more Chambord cocktails in these really nice mason jars. My good friend Kimlai and I promptly took a break from our class and continued on eating and drinking. After all... that's what brunch is all about, right? So just how great was Fleurish? They had a social media photo area for you to show off your finished product. I was very proud of my pineapple flower arrangement. Of course, I pulled in our man servants for a group photo! By the way, there are multiple Fleurish locations, so click here to find the one closest to you. We hopped back onto our bus and were let out at Surfas in Culver City. For those that have never been, it's a worthwhile stop especially if you love food. Surfas is a restaurant supply store/mini market. They also have cooking classes taught by local chefs. Being the gracious hosts that they were the entire day, our man servants fed us Chambord Spiced Berry Punch cocktails once we arrived for our surprise Chambord-inspired cooking class. It was also pretty hot inside Surfas so they were nice enough to fan us as well. We had some great and very patient teachers who taught us how to create three Chambord inspired dishes from scratch. There was a Chambord infused gold encrusted monte cristos and crispy latkes topped with purple glitter in honor of Chambord. We even whipped up eggs and formed filo dough into muffin tins to make into egg cups. These were essentially ham and cheese sandwiches on steroids. They were deep fried and oven baked with panko crumbs. The raspberry was topped with purple Chambord glitter and the sandwiches were topped with gold flakes...because no one should ever have to eat a sandwich without golden, glistening flakes. After a full day of eating and drinking Chambord and meeting new friends, I was ready to roll on out of there with my Chambord and flower arrangement in tow. That was definitely the ultimate brunch experience. I got to try new places and new experiences with a fun group of gals and of course, Chambord, and our man servants. Thank you Chambord and MWW for an unforgettable experience. Also, if anyone needs any great party ideas, I'd suggest following this post to a T! It was a great time had by all! Thank you Man Servants! To see more pictures from our ultimate brunch experience, search the hashtag #punchandbrunch on Instagram or on Twitter. To follow Chambord and see what other cool things they have up their sleeves click here. Jun 25 Celebrate Canada Day in Los Angeles!